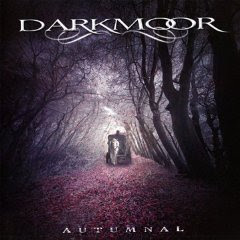 Hall of the Mountain King: Review: Dark Moor, "Autumnal"
Though this is their seventh record, my introduction to Spanish symphonic metallers Dark Moor came through their 2007 outing, "Tarot," which had some strong moments, but overall was a mediocre effort with a little too much standard power metal. Not a great deal about their sound has changed on "Autumnal," yet it strikes me as a much stronger effort. The record starts promisingly with “Swan Lake,” a heavily classical-influenced number that should appeal to fans of bands like Rhapsody of Fire. But second track, “On the Hill of Dreams” reminds me of what brought Tarot down. It’s a pretty standard power metal number without much to recommend it. Business picks up again on “Phantom Queen” with a frenzied blast of Celtic fiddle on the opening and an incredibly catchy chorus reminiscent of some of the more bombastic efforts from Queen or Blind Guardian. It also sees the debut of a bit of a growl from vocalist Alfred Romero. The problem, as on the last record, is that Dark Moor keeps switching back and forth between powerful and interesting symphonic numbers and generic power/melodic metal numbers. The more standard tunes are not horrible, but they’re songs I’ve heard thousands of times before. Thankfully, there’s much more of the symphonic here. Those numbers, on the other hand, are really, really good. “Faustus” brings an operatic feel on the chorus, with just a little touch of darkness. “When the Sun is Gone” features a darker verse than other pieces on the record, and I also like Romero’s gruffer vocals. Surprisingly entertaining is “For Her,” which made me expect a sappy ballad. Instead, I got a nice medieval flavored melody in the symphonic bits, perhaps like something from the soundtrack of an adventure movie. “Enchanted Forest” offers a very dramatic, slightly gothic flavor that’s very tastefully done. I also admire the album closer “Fallen Leaves Waltz,” a powerful, full-on classical number influenced by Tchaikovsky. If I have one complaint with the record (and this is true of many bands in the genre), it’s the very similar song structures that fill the album — energetic, loud openings with a drop off to a mellow verse, followed by a return to the energy for the chorus. I know it’s a pretty standard song structure in power metal, but I’d really like a little more creativity from a band that obviously has the talent and vision to provide it. I leave "Autumnal" much more impressed with Dark Moor than I was previously, and I can wholeheartedly recommend that fans of symphonic metal check out this record.